I'm not sure there's anything sadder than the sight of an empty pool, especially when the nearby indoor pools are closed for maintenance. My body misses being buoyant and my arms miss the exhaustion and my lungs are tired of breathing through air and not through water and my legs miss the muted thunk, thunk, splash. Soon, I tell myself, my hair will be knotted with chlorine again, and soon, though not nearly soon enough, I will be swimming outside again. I grew up close to Lake Ontario, but my childhood swimming always took place in public pools, northern lakes and the occasional backyard pool. So when I moved to Roncesvalles, a few blocks and a bridge north of the lake, with no pools with early morning length swims nearby, I decided it was time to jump in. There was a pilot project that summer, where the curve of lake at Sunnyside was cordoned off and cleaned with UV light. I didn't look into the science, I just believed the sign and biked down at 7am every morning in June, left my trackpants and my towel in the sand and swam. It was so cold. Colder than any swim I've had in a long time, but I was determined to swim before heading into work. The water was thick and sludgy, and weeds trailed along my arms. (I still shudder thinking about the weeds). But I swam, trying not to swallow any water, pretending I wasn't as cold as I was, back and forth along the rope, channelling my inner Marilyn Bell. She was 16 -- I was 30 and I was just swimming back and forth, not across the entire lake! I would bike home shivering, picking up coffee smelling like lake water. It would take at least 45 minutes in the hottest shower to keep my teeth from chattering for the rest of the morning. But I swam in the lake as the sun cleared the highway, alone, in a small section of this huge lake, that looked sometimes like the ocean. I will always remember the day as a wee Wills Kid that I was walking along some beach with my dad, and we came upon a man who was patiently building the most BEAUTIFUL sandcastle I had ever seen. He didn't have a bright yellow shovel, or a pail either. He just had a hole, dug in the sand close enough to the water to collect the occasional wave, and not so close that a wave would undo his last 3 minutes of genius. Risky business, this style of architecture. His castle looked like sugar. Like a Cambodian jungle artifact. Like the headdress for the most glamourous of Hindu goddesses. Like a pile of weird sausages. I loved it so much, his drip castle. He showed me how to do it. And ever since then, whenever I find myself on a sandy beach walk, I'll stop-drop-and-drip. Sometimes I might quickly hijack someone else's left-overs (an exquisite corpse), and sometimes, if I'm by myself and there's no one around, I'll start from scratch, breathing in the sea air, and listening to the applause of the waves. I have a fear of seaweed. It’s ridiculous and enduring. The idea of stepping into water and sinking into a tangled mess of slimy and ropy weeds, is always on my mind when I approach a new swimming hole. I was once thrown into a pond at a house party, on a back road somewhere in Grey County. I remember before I met my sopping wet fate, staring at a thick carpet of seaweed just below the pond’s surface, and shuddering… and the next thing I knew, I was falling back first, into that very cradle of watery green fingers. I was so terrified, I literally projected back out of the water like a possessed being, straight into my dads arms, frozen in the position I fell in, with a nose bleed… I kid you not! But for one summer, I conquered my fear of weeds, all thanks to a wonderful friend, her front pond and some swim goggles. My dear friend Tarryn, had a pond in her front yard, that we spent pretty much every swimmable day in over the summer. It was almost the perfect pond… except for the seaweed, which was obviously a wee bit of a problem for me. Getting in and out without touching it— impossible! Finally, after what was probably an absurd scene of me flailing and thrashing about in the shallow end, Tarryn told me I had to get over my seaweed phobia, and suggested I put on some goggles, explore the bottom, and really see that there was nothing to fear. No creatures, no monsters, and no weird shark like bugs waiting to tear me to shreds. And so I did it. I spent an afternoon, diving down and examining my sepia toned enemy and sure enough I discovered… it WAS beautiful! A secret world of submerged minty lace and flora, peacefully dancing between sunken sunbeams. I did see fish and bugs fluttering through the spongy universe— not my favorite part— but none had dinosaur teeth… so that was reassuring. And just like that for the rest of the summer, I didn’t care. I could walk in without goose bumps and crippling dread. It was amazing! Sadly it did not last. 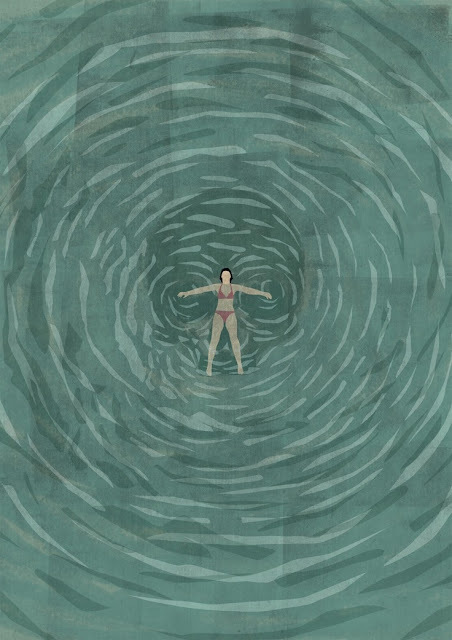 My aversion has returned, probably because now I reside in the city where most of my daily swimming haunts are weed free pools and I’m no longer exposed to the grassy underwater world of yesteryear. But thankfully, on the occasions when I do come face to face with a really tangled up ol' water hole, I need just a minute to remember Tarryn’s training, and that beyond my trembling imagination, there is also a beautiful world waiting for me, deep down at the bottom. Unless of course there are sea creatures with dinosaur teeth… then I’m definitely not going in. 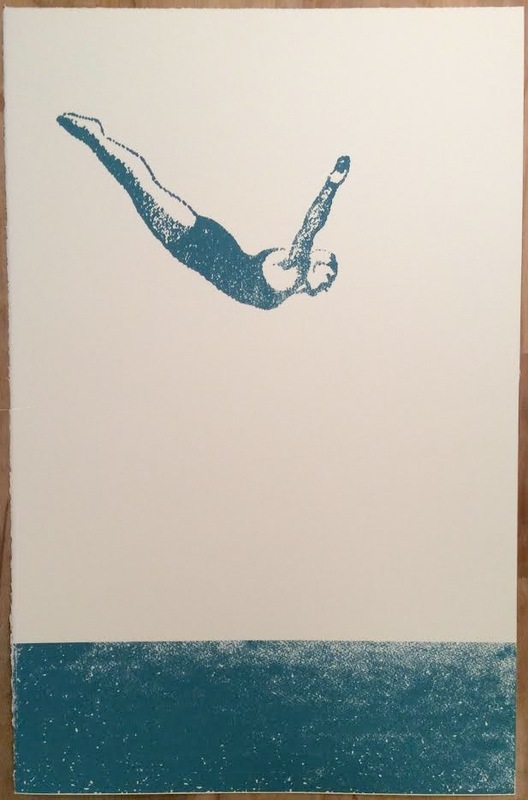 Laura's swim-art Pinterest board is so inspiring! And then I looked up from my computer screen and realized how much swimming art we've got up in our house. 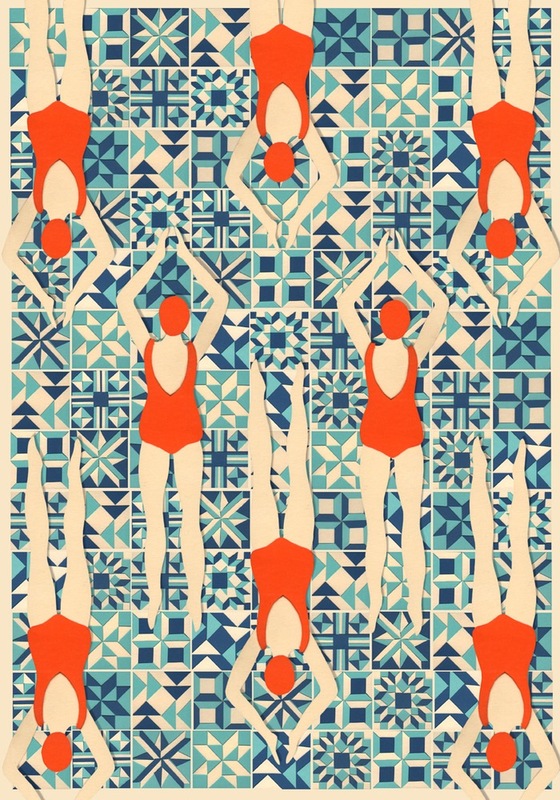 I am just smitten with Lou Taylor's Swimmers print (above) that lives in our kitchen. I do a lot of drawings beside swimming holes. 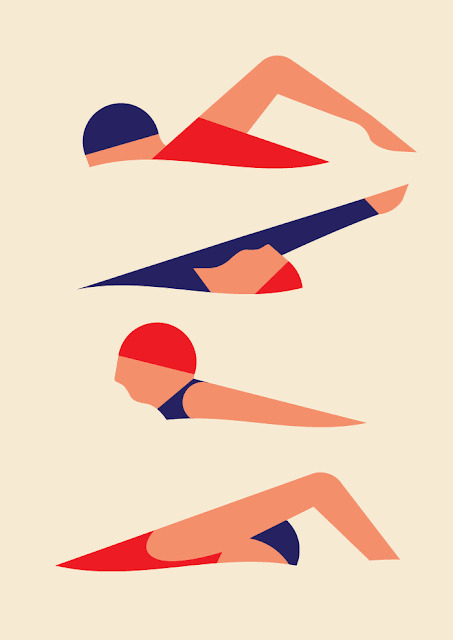 I love swimming art. I've started a little collection on my Pinterest board if you'd like to follow along. The days are getting shorter (eeek!) and the evenings are getting cooler. The outdoor pools are closed and the water in most nearby swimming holes is verging on too cold to swim in. And that can only mean one thing: time for one more round of happy hour rocktails on the shore of Lake Ontario. This rocktail session featured Bloody Marys, our favourite 1 1/2 year old, and the most stunning September sunset. My spandex suit of armor, that gave me the extra courage I needed to take on rowdy river currents, seaweed swallowed swimming holes, and leach infested ponds. A gift from my Nana Ruth, it was black with a rainbow lattice up one side. It carried as many badges as I could fit from my hip bone to my ribs. I think this suit was mine first and then passed to my sister. I loved it because my bellybutton showed through the hole in the butterfly and what kid doesn't love to show off their bellybutton? Purchased at a Mexican Kmart, after my luggage was lost on a trip to see the coast. It was a brown bikini with turquoise ruffles. It had a good run, but recently had to be put to pasture… due to too many swims. My very first non-sports bikini. My very favourite swims have been in this wee number. I hate swim suit shopping, so a couple of years ago I decided to just get a perfect black bikini top that fit me beautifully and pair it with whatever bottoms suited my fancy. "Perfect" and "fit me beautifully" = "cost a fortune" but I do love it and it goes with me everywhere. What will become of our swimmers this winter? Icy adventures? Frozen toes? Or just infinite dreams of warm blue secret swimming holes scattered across the universe? Stay tuned fellow water wanderers... only time will tell. 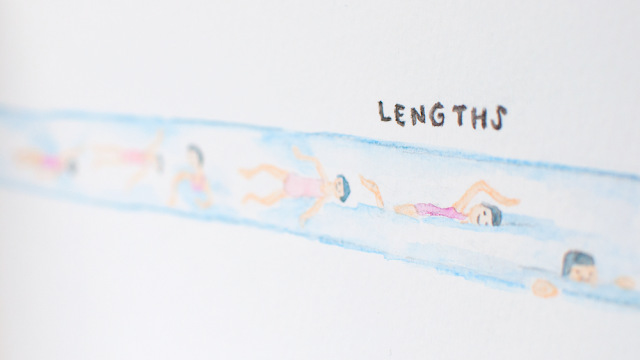 The swimmers of this blog had a discussion early on about whether swimming pools counted as swimming holes, and the unanimous decision was resoundingly YES. There was even talk of outdoor pools that counted as religious experiences. So in honour of Labour Day in Toronto, which marks the annual closing of our outdoor public pools, we shed a tiny tear, and salute the swimming pool with a post of our all-time favourites. The green marble pool at the Castello di Vicarello in Tuscany, for no other reason than it was insanely beautiful. 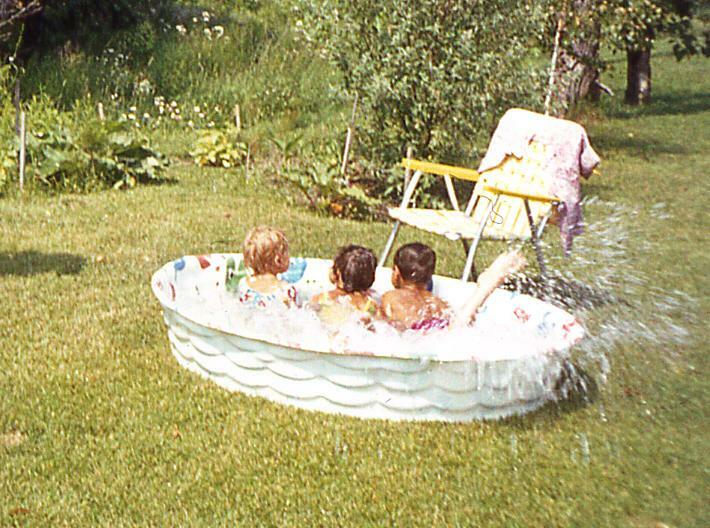 My childhood backyard kiddie pool in Montreal. We spent HOURS in here. Splashing, fake swimming, fighting, laughing. Definitely in my faves list. The pool at the Palácio do Freixo just outside of Porto, Portugal will always hold a special place in my heart, not just because it's stunning and I swam there on the last day of our honeymoon, but also because I found out I was pregnant just moments before jumping in. Here are my top 5 outdoor swimming pools I've had the pleasure of meeting throughout the years! 1. My Grandmother's pool in Leskard, Ontario. Where I learned to be a dolphin. 2. 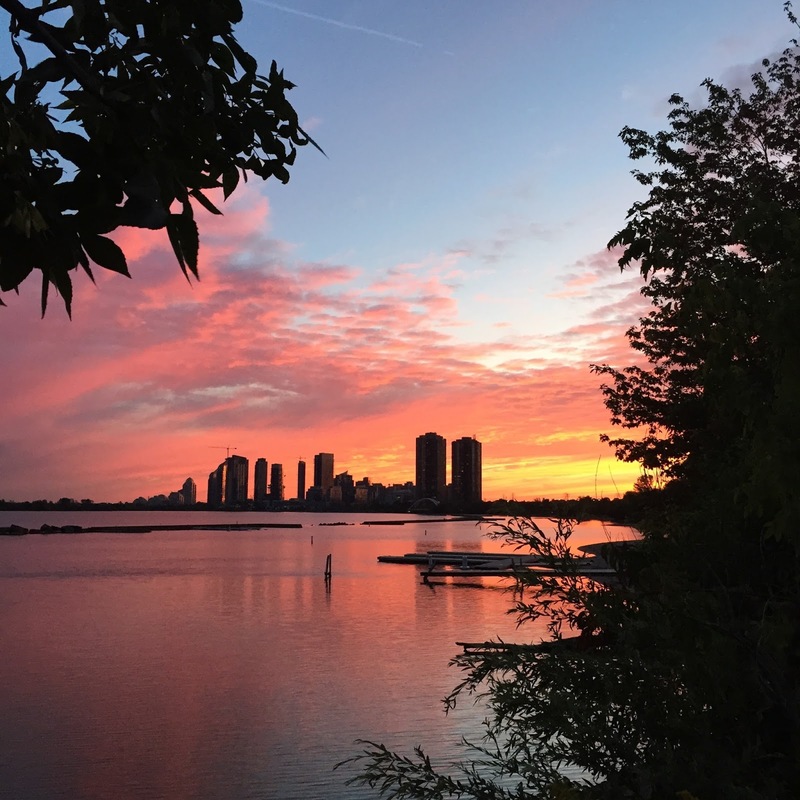 The Miller's pool in Etobicoke. Where I learned the definition of "pool party". 3. The pool at the Hacienda De Cortes in Cuernavaca, Mexico. Where I learned that secret gardens with dreamy pools are real! 4. My Aunt's pool in Keene. 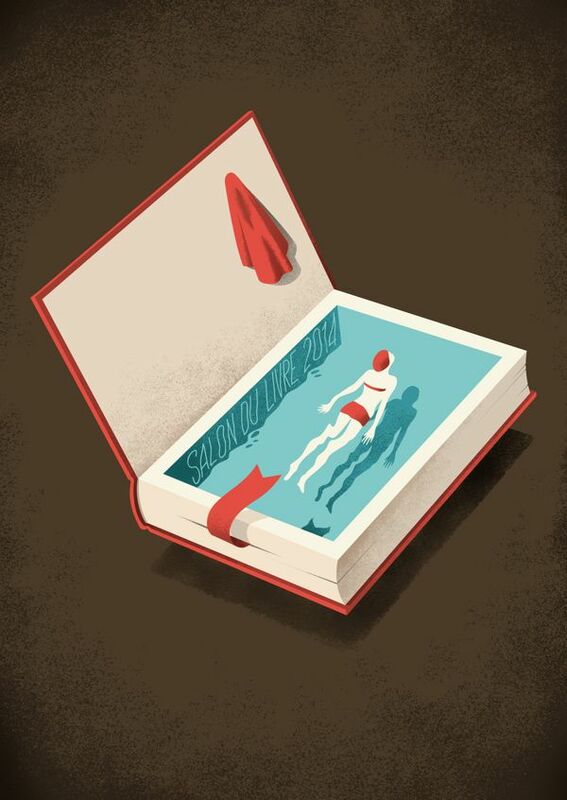 Where there were stacks of magazines, fluffy towels and oodles of stories soaked in chlorine. 5. My most recent addition, the Giovanni Caboto pool in Toronto. Right up the street. Perfect for summer evening lengths. I raise a toast to you all today! When I was pregnant, he would kick even more than usual when I was in the bath, kicking so hard, the water would ripple from where his heels struck. 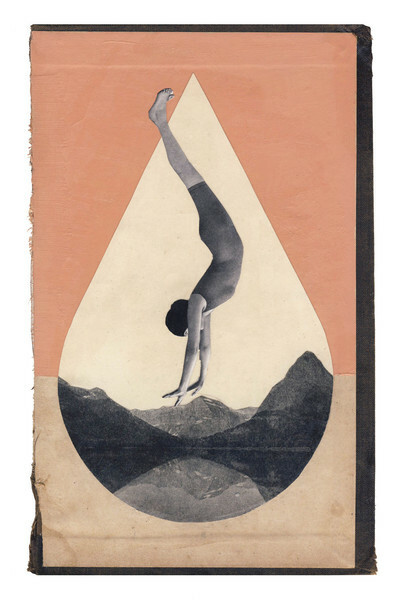 And when I would swim, spandex stretched over my belly, he would spend lengths doing somersaults, and when he got too big for somersaults, he would pummel the space under my ribs. He was born a Pisces, our little water baby. 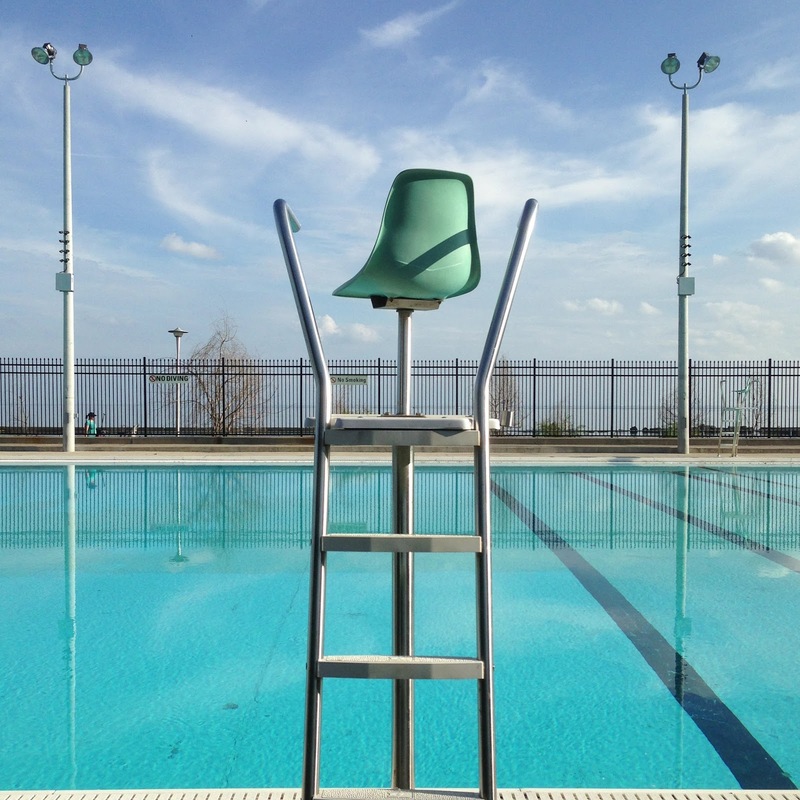 Sadly, the pool just blocks from my mom's house where I learned to float and blow bubbles, coloured badges sewn up the side of my suit, is closed this summer, but there is another pool nearby, one I used to lifeguard at. This was Jack's first swimming hole. He was skeptical at first, but over the last two months has grown to love it, perfecting an inchworm-style kick, learning to splash (today's watery triumph), laughing when anybody blows bubbles, and grinning when he gets splashed by the big kids' cannonballs. I never want Labour Day to come mostly because I don't want the pools to close. Back in the day when I was an art director for an adventure travel company, I had the pleasure of visiting some truly great swimming holes in Europe with the illustrious (and always fun) NY photographer, Rob Howard. Getting the perfect swimming-hole shot in action is not as easy as it looks. In the days when we were still shooting actual FILM, Rob had to make every shot count. Each frame of 120mm film cost about 3 bucks, and we only had the finite amount of film he and his trusty assistant could carry with them on a 2-week photoshoot. None could be wasted! Then a couple of years later, digital came along and we were relieved of that burden, but it still takes a particular skill and art to get those shots just right. The human body in motion is a tricky thing -- if you catch an arm or a leg in a not-quite-right position, it just reads as WEIRD in a photo. And the timing is so crucial... one moment your subject is rooted to land, the next they are airborne, then there is the splash (also worth capturing) and then they are gone, under water. Photographs courtesy of Rob Howard. 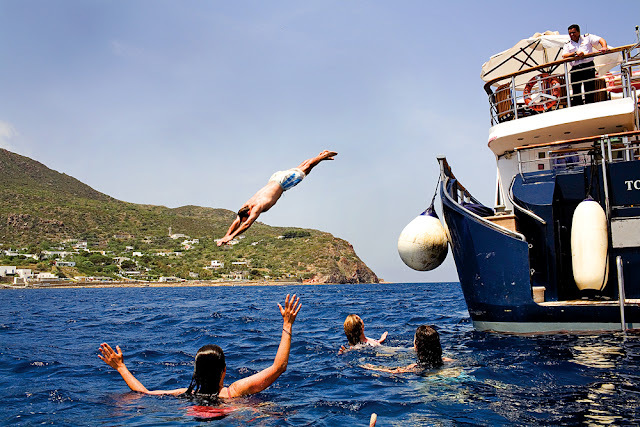 Rob shot us jumping off our little yacht, The Callisto, in the Aeolian Islands from a sea kayak.